TSPSC Tutors Final Selection list Results 2019: TSPSC Tutors Results, Certificates Verification 2018, TSPSC Tutors Hall tickets, Preliminary Answer key, Main Anser Key, Results. TSPSC Tutors Recruitment 2017 in Director of Medical Education: TSPSC jobs: TSPSC Tutors 2017 Recruitment, TS DME Tutors 2017 Recruitment, TSPSC has published the Civil Assistant Surgeons 2017 recruitment notification and Applications are invited Online from qualified candidates through the proforma Application to be made available on Commission’s WEBSITE (www.tspsc.gov.in) to the post of Tutors in Director of Medical Education (HM & FW Department). TSPSC Tutors (Non-Clinical) Provisional Selection List Results 2019: The Commission published the List of Provisionally Selected Candidates for the post of TUTORS (NON-CLINICAL) IN DME (HM&FW DEPARTMENT), on the basis of CBRT Examination held on 23/10/2017 & 24/10/2017, verification of certificates held on 19/05/2018, 07/01/2019, 08/01/2019 and Oral Test (Interview) held on 30/01/2019. The list of provisionally selected candidates is available on the Commission’s website (www.tspsc.gov.in). TSPSC has notified that on the basis of the CBRT examination held on 23/10/2017 FN and 24/10/2017 F.N, verification of certificates held on 19/05/2018, 07/01/2019, 08/01/2019 and Oral test (Interview) held on Dt: 30-01-2019 at TSPSC Office, Hyderabad to the post of TUTORS (NON-CLINICAL) IN DIRECTOR OF MEDICAL EDUCATION ( HM&FW DEPARTMENT) the following Hall ticket numbers have been provisionally selected for appointment to the post of TUTORS (NON-CLINICAL) IN DIRECTOR OF MEDICAL EDUCATION (HM&FW DEPARTMENT) vide Commission’s Notification No.42/2017, Dt: 15-08-2017. The selections are published here with subject to the following conditions. With this Notification of Selection, the General Recruitment process notified vide Notification No: 42/2017 for the post of Tutors has been finally concluded. 1. It is hereby notified that on the basis of the CBRT Examination held on 23/10/2017 & 24/10/2017, verification of certificates held on 19/05/2018,07/01/2019 and 08/01/2019 to the posts of Tutors (Non-Clinical) in Director of Medical Education, the candidates with the following Hall Ticket Numbers have been provisionally admitted for the ORAL TEST (Interview). 3. If, on further verification, it is found that any candidate is not eligible with reference to the particulars furnished by him/her in the Application Form / Check List / Certificates, the results of such candidate / candidates shall be cancelled at any stage of selection process. The Commission published the List of Hall Ticket Numbers of provisionally admitted candidates for Interviews (Oral Tests) for the above post on the basis of CBRT Examination held on 23/10/2017 & 24/10/2017. The Interviews (Oral Tests) will be held in the office of TSPSC at Prathibha Bhavan, Nampally, Hyderabad on 30-01-2019 . Further it is informed that the List of candidates (Hall Ticket Numbers) and further details are available in the Commission’s Website www.tspsc.gov.in. TSPSC has informed that the Commission conducted Oral Test (Interviews) on 21/12/2018 for the post of Tutors (Clinical) in Director of Medical Education (HM&FW Department) vide Notification No. 42/2017. The list of provisionally selected candidates for the above said post is available in the Commission’s website www.tspsc.gov.in . TSPSC has notified that on the basis of the CBRT examination held on 23/10/2017 FN and 24/10/2017 F.N, and Oral test (Interview) held on Dt: 21-12-2018 at TSPSC Office, Hyderabad to the post of TUTORS (CLINICAL) IN DIRECTOR OF MEDICAL EDUCATION ( HM&FW DEPARTMENT) the following Hall ticket numbers have been provisionally selected for appointment to the post of TUTORS (CLINICAL) IN DIRECTOR OF MEDICAL EDUCATION (HM&FW DEPARTMENT) vide Commission’s Notification No.42/2017, Dt: 15-08-2017. The selections are published here with subject to the following conditions. 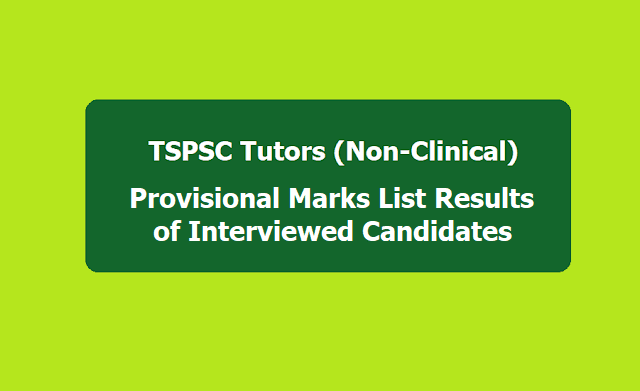 TSPSC Tutors Results for Interview (Oral Tests) 2018 (List of candidates): The TSPSC, Commission has published the List of Hall Ticket Numbers of provisionally admitted candidates for Interviews (Oral Tests) for the above post on the basis of CBRT Examination held on 23/10/2017 & 24/10/2017. The Interviews (Oral Tests) will be held in the office of TSPSC at Prathibha Bhavan, Nampally, Hyderabad on 21-12-2018 from 09.30 A.M onwards. Further it is informed that for the List of candidates (Hall Ticket Numbers) and further details are available in the Commission’s Website www.tspsc.gov.in. The candidates who have qualified for Oral Test (Interview) are required to attend at TSPSC Office along with Hall Ticket, Original Certificates, and Three (3) passport photos on the relevant date and time as mentioned in the mentioned schedule. 1. In continuation of result notification for verification of Certificates dated: 14/05/2018, 04/08/2018 and 30/10/2018 it is hereby notified that on the basis of the Written Examination held on 23/10/2017 FN& 24/10/2017 FN to the posts of Tutors in Director of Medical Education (HM & FW) Department, in order to avoid multiple phases of certificate verification the commission decided to conduct certificate verification for all the qualified candidates, therefore the candidates with the following Register Numbers have been provisionally admitted for verification of Certificates. 2. The candidates who are shortlisted for verification of Certificates are required to produce the Original Certificates along with one set of Photostat copies duly attested by Gazetted Officer, relating to Age, Qualifications, Community (Integrated) latest Creamy Layer exemption certificate in case of B.Cs as per Memo No. 3009/BCW/OP/2009, Government of Telangana, Backward Classes Welfare (OP) Department, Dt:18/12/2015 (prescribed format hosted on website), Certificates relating to claim of age relaxation, Study (from 4th class to 10th class) and if any, at the time of verification of documents, failing which they will not be admitted in subsequent process of selection. In terms of the notification the candidates should possesses the requisite qualifications as on15-08-2017. 3. The verification of certificates will be held in the office of TSPSC at Prathibha Bhavan, Nampally, Hyderabad on 30 -11-2018,01-12-2018 and 03-12-2018, The candidates are instructed to obtain and keep ready all the certificates as mentioned in the Notification. The Commission published the List of Registered Numbers of provisionally admitted candidates for Verification of Certificates (II Spell) for the above post on the basis of CBRT Examination held on 23/10/2017 & 24/10/2017. The Verification of certificates will be held in the office of TSPSC at Prathibha Bhavan, Nampally, Hyderabad on 08-08-2018 from 02.30 P.M onwards. Further it is informed that for the List of candidates (Register Numbers), and required formats i.e. Check List, Memo, Attestation forms are available in the Commission’s Website www.tspsc.gov.in. Applicants must possess the qualifications from a recognized University as detailed below or equivalent thereto, as specified in the relevant Service Rules, indented by the department as on the Date of Notification. 1 Tutor(Clinical) As per Medical Council of India Regulations, MBBS for Clinical Departments. The applicant Must register the MBBS qualification on permanent basis, with Telangana State Medical Council. 2 Tutor(Non-Clinical) As per Medical Council of India Regulations, MBBS/MSc (Medical in concerned Specialty) for non-Medical persons. The applicant Must register the MBBS qualification on permanent basis, with Telangana State Medical Council. With regard to (5) other eligibility qualifications (i.e., M.Sc. Bio-/chemistry (Medical), M.Sc. Anatomy (Medical), M.Sc. Physiology (Medical), M.Sc. Pharmacology (Medical) and M.SC. Micro-Biology (Medical), registration with the Telangana State Medical Council is not mandatory. *As per G.O. Ms. No. 329 GA(Ser.A) Dept., Dt. 27/07/2015 read with G.O. Ms. No. 264 GA(Ser.A) Dept.,Dated: 26-07-2016 and G.O.Ms.No.190 GA (Ser.A) Dept., Dated:08-08- 2017, the upper age limit is raised by 10 years. TSPSC Tutors Recruitment 2017 Hall tickets: Hall tickets can be downloaded 7 days before commencement of Examination. The candidates who applied for the posts of Tutors (42/2017) are requested to note the examination dates for various posts as mentioned herewith. ii. Educational Qualification details i., SSC, INTERMEDIATE, DEGREE, POST GRADUATION etc. and their Roll numbers, Year of passing etc.